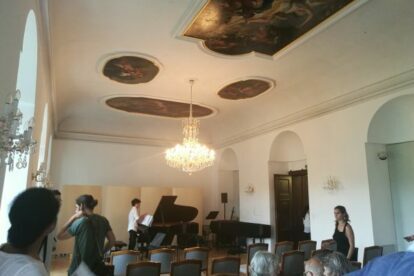 There’s this one great thing to do while being in Vienna, enabling you to enjoy a concert in THE city of classical music without spending a dime. Listening to music, paying nothing and showing your interest in Vienna’s musical pride to be. Sounds great? It is! – literally. The principle is simple: Groups of music students get to present their artistic and creative progress in public, on a regular basis, in their class presentations. So you’ll get to enjoy their presentation in one of the many beautiful chambers of the institution. Going beyond, there’s a great variety of acoustic matinees, vocals soirees and music brunches (calorie- and greaseless, delicacies for our ears only) being communicated over their website. And as the Music University is situated right next to Belvedere you’re likely to have a great view from the showroom as well. I myself was very impressed when Ι attended for the first time. Here‘s where you’re supposed to land within the (now also available in English!) website. You’ll find a list of events, the ones named ‘Studienkonzerte’ are what you have to search for. Classical or contemporary music within magnificent yesteryear architecture, in combination with excerpts of Vienna’s bright musical future. Sold?